To use the sampling tool you will need a data set with a variable of type character. Entries should be unique (i.e., no duplicates). A dataset that fits these requirements is bundled with Radiant. On the Data > Manage tab click the examples radio button and then click Load examples. Select rndnames from the Datasets dropdown. Names is the relevant column in this dataset and it will automatically be used as the base for sampling. Now simply choose the sample size you want and a list of names of the desired length will be created. How does it work? Each person in the data is assigned a random number between 0 and 1 from a uniform distribution. Rows are then sorted on that random number and the \(n\) people from the list with the highest score are selected for the sample. By using a random number every respondent has the same probability of being in the sample. 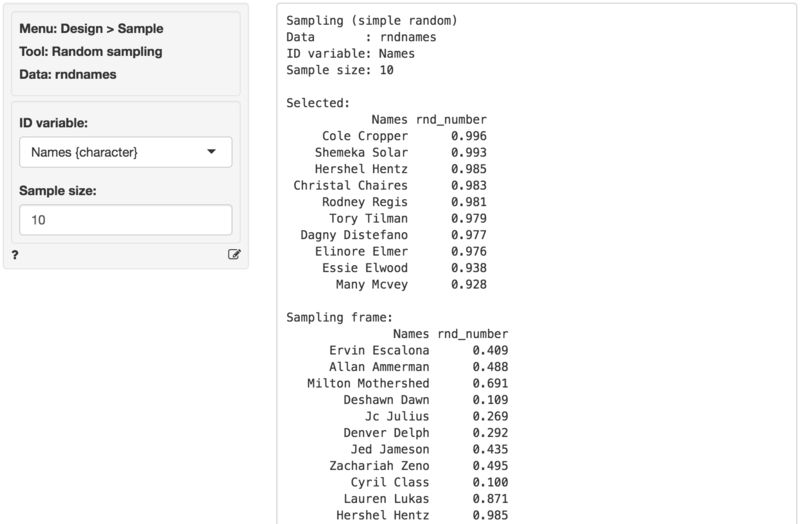 For example, if we need a sample of 10 people from the 100 included in the rndnames dataset each individual has a 10% chances of being included in the sample. The full list of 100 people is the sampling frame. Ideally, this is a comprehensive list of all sampling units (e.g., customers or companies) in your target market. How do you determine the appropriate value for n? See the sample size tool in the Sample menu.